Open educational materials are very popular. But how can lecturers be convinced to use open educational resources – or even better, create them? Tutorials, guidelines, videos and other information for researchers, lecturers and other interested parties play a key role here. Open Educational Resources (OER) are being accepted more often in universities. According to a recently published study, a large number of universities in the United States, for example, offer their professors support when shifting from printed textbooks to open educational resources. The Campus Computing Survey 2018 stated that 64 per cent of universities surveyed revealed that they encourage their members to use open educational resources in their courses. In 2014, this figure was just 34 per cent. According to the survey, 52 per cent of universities also support teachers when creating their own OER materials. A number of tutorials and other sources of information are available online to assist in the creation of open educational resources. Besides offers of support from universities, this also includes OER projects and OER information centres. We have put together a selection below. Ruhr University Bochum offers a self-learning course “Introduction to open educational resources” (OER). It covers how to look for OER and how to create them yourself. The course is around 120 – 160 minutes and also includes exercises, self-learning tests and gamification elements. Algonquin Colleges offer a comprehensive course for anyone interested in the OER movement. The main topics are: copyright, best practices when searching, and using OER. At the end of the course, participants are invited to create an open resource to learn from or teach themselves. Penn State University Libraries have information especially for lecturers who develop MOOCs or take part in them. In this respect, they offer information on how to use Open Educational Resources. The University of the Witwatersrand Johannesburg offers a LibGuide that includes guidelines, tools and course content for OER, as well as a range of other things. Fort Hays State University gives a brief overview of open educational resources in addition to comprehensive, detailed information. This includes the comprehensive Forsyth Library OER Research Guide with OER research tips. A very clear OER tool kit is offered in the College Libraries Ontario’s “The Learning Portal”, where explanations are given on how to search for, use and create open educational resources. Saxon State and University Library Dresden (Sächsische Landesbibliothek — Staats- und Universitätsbibliothek Dresden, SLUB) also offers an introduction to open educational materials (link in German). 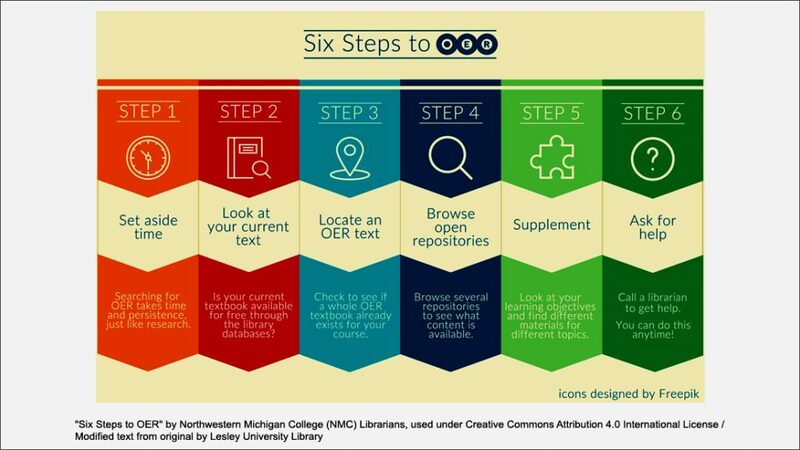 Other universities that provide comprehensive information on OER include Reynolds Community College Libraries with their Research Guide Open Educational Resources, Bridgewater State University Maxwell Library, the Prince George’s Community College and the University of Pittsburgh Library System. 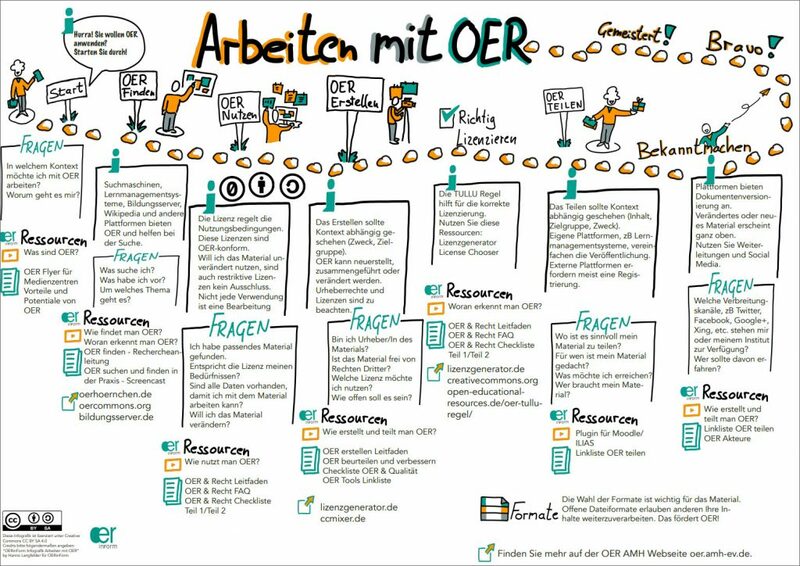 One of the things the OER information centre (OERinfo) offers is a guide to creating OER (link in German), which lists many resources. 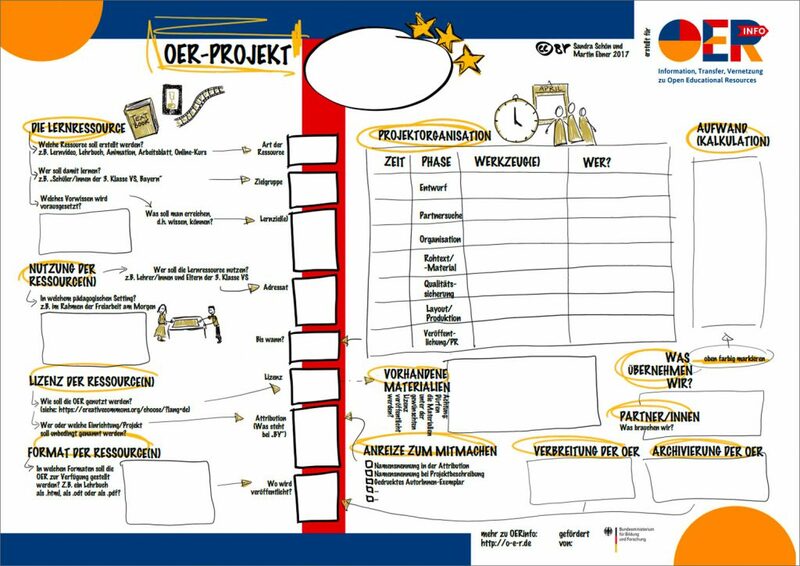 As an example, it offers the OER Canvas (link in German), which is a template to initially outline OER projects, and eight brochures with compact knowledge about OER (link in German). A Guideline for creating open educational resources – information and practical exercises for university tutors2 (link in German) is offered by Open Education Austria in addition to a number of other materials and downloads. The Open Education Handbook includes a range of information to assist OER in practice. This includes information on creating and developing OER, helpful software, publishing OER and tools for creating and remixing OER. You can find a number of Open Educational Resourcesopen educational resources videos on YouTube. These include the eTwinning Open Educational Resources: Start creating your own OERs and from the OERinForm project, “How do you create and share OER (Open Educational Resources)? Create and share OER” (in German). The OERinForm project doesn’t just offer video tutorials on YouTube. It also has a collection of these on its website (link in German). You can also find many more informational materials for media and e-learning centres, lecturers and other parties interested in OER. Presentations, checklists for university tutors, link lists, a template for developing a university concept for OER, guidelines for creating OER, a manual on using OER in universities and infographics for those involved in OER at a university and the working process with OER are just some of the topics available for download (link in German). Do you have any other tips for OER tutorials? We look forward to hearing your references; please feel free to leave them in the comments.